There’s probably no better contrast in the race for supervisor in Stanislaus County’s District 4 than that between Frank Damrell and his opponents Tom Berryhill and Janice Keating. 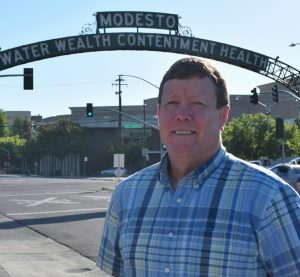 Everything about Frank Damrell represents Modesto’s and the county’s better days, while too much about Berryhill and Keating reminds us of the calumny and corruption in the era of Trump. 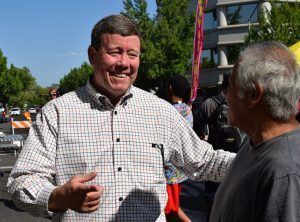 Steve Ringhoff’s excellent report about Tom Berryhill’s violations of rules required by the Fair Political Practices Commission is a cogent reminder of the casual corruption that runs rampant in today’s politics. In 2014, Berryhill paid a $40,000 fine for what amounted to a money-laundering scheme for campaign funds illegally provided by his brother. If Tom Berryhill represents one side of our new politics, Janice Keating represents another. Styling herself a watchdog over government waste and corruption, Keating stunned colleagues on the Modesto City Council when she billed the city for expenses incurred driving from her home to council meetings—a round trip of five miles. In all, Keating billed more for expenses than any other councilmember. But her chintziness is just one aspect of Keating’s approach to public service. Another is her promotion of hate mongers like Ann Coulter and Sheriff David Clarke, both of whom were brought here by the local Republican Party. As Executive Director of the Republican Party of Stanislaus County, Keating has been an avid promoter and cheerleader for the divisiveness, xenophobia, and contempt for law represented by Coulter, Clarke, and others like them. If we are ever to escape the dysfunction in today’s government, we have to bring people together again. Frank Damrell, a quiet pragmatist respected by everyone who knows him, is uniquely suited to work with others toward real solutions to our problems without resorting to party preferences or rigid ideology. Damrell is one of those “people-persons” who used to be regular features of downtown Modesto. When Frank Damrell sees someone he knows or meets someone new, his face lights up, his smile spreads, and his eyes twinkle. This is a man who loves people. And while Damrell may be easy-going and friendly, he’s also not afraid to work hard and often to get things done. As an aide to California State Senator Kathleen Galgiani, Damrell frequently takes on the underappreciated scut work of researching and building consensus for legislation, as well as attempting to address the complex problems of constituents in need. Frank Damrell chose to run for supervisor in Stanislaus County because he believes in community service and has an unusual capacity to work for the good of the region. He’s an easy choice for supervisor in Stanislaus County’s District Four.